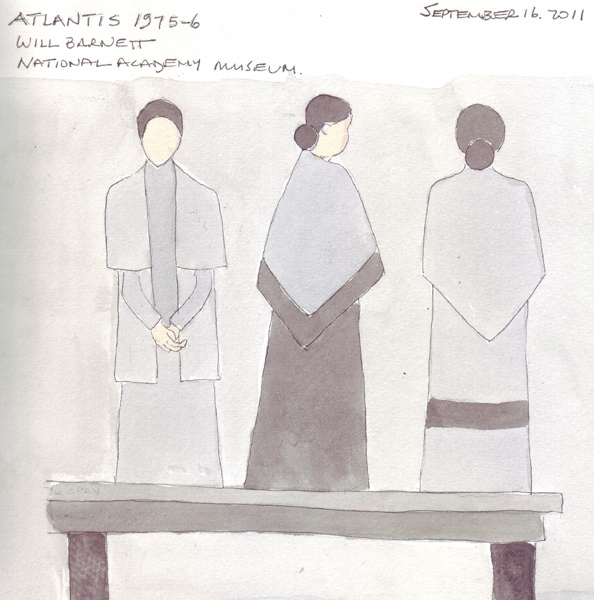 The "Will Barnet at 100" exhibit opened last weekend at the newly renovated National Academy Museum in New York City. I wasn't familiar with his painting, but loved the exhibit that spanned his very long, active career. He is still painting and will actually be at the Academy next month for a "conversation! I couldn't find images on the National Academy website, but here is a link to images of his work in a gallery. I loved his paintings in general and "Atlantis" in particular. It consisted of 15-20 women all standing on a pier overlooking the sea. 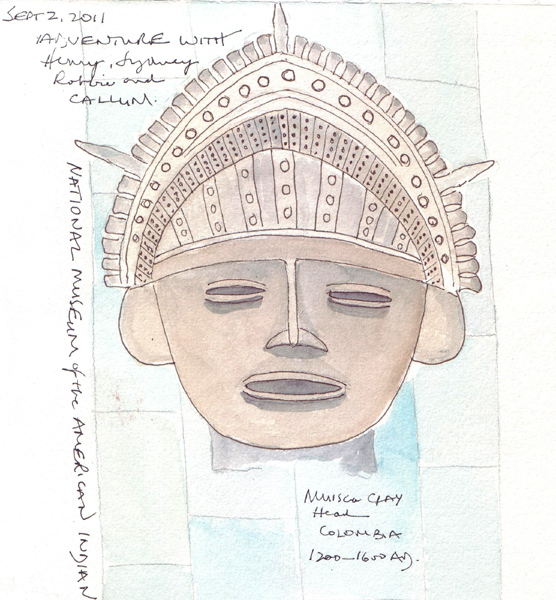 I painted several of the women in my sketchbook to remember the exhibition. I couldn't find an image of the original to include here, but my friend Pat also sketched it and wrote about it on her blog. 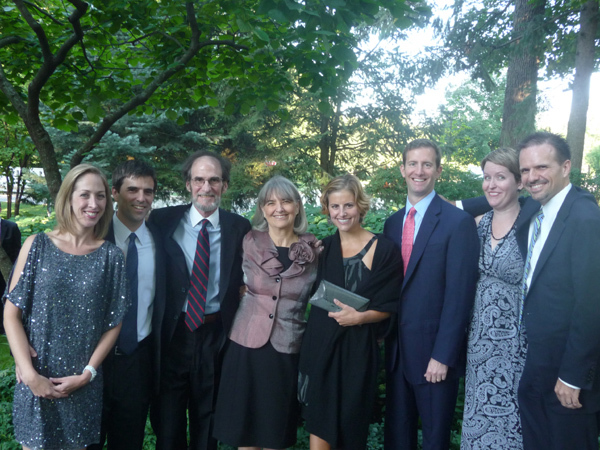 We went to a family wedding in Chicago last weekend, and all of our children and their spouses were there too. So we managed to get one of our rare family photos: my husband and I, our 3 children and their spouses. My husband and I lived in Chciago many years ago, and enjoyed staying a few extra days with friends. We saw Millenium Park for the first time and enjoyed a return visit to the Art Institute. 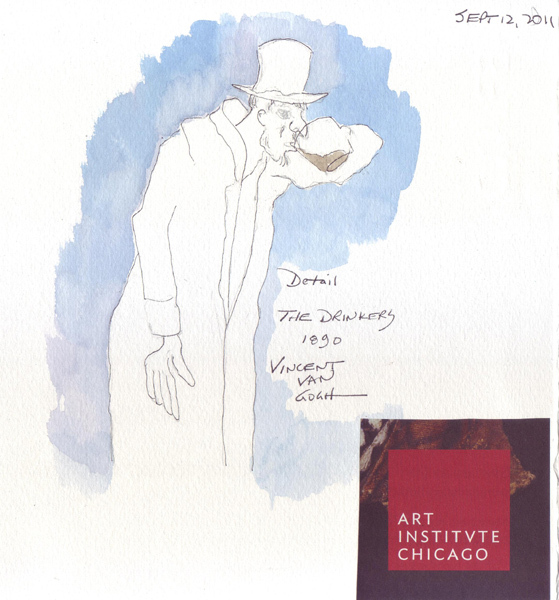 This is a drawing of one of 3 "drinkers" of a Van Gogh painting that I had never seen. 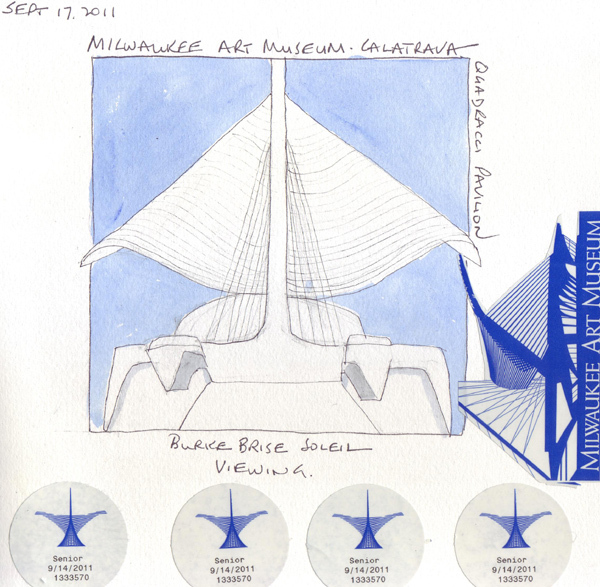 Our friends took us to see the Milwaukee Art Museum and the Calatrava-designed Quadracci Pavillion. It is magnificent! Three times each day these bird-like wings open up, filling the building below with amazing light. I drew the open wings from a photo I took while standing outside on the pedestrian bridge. 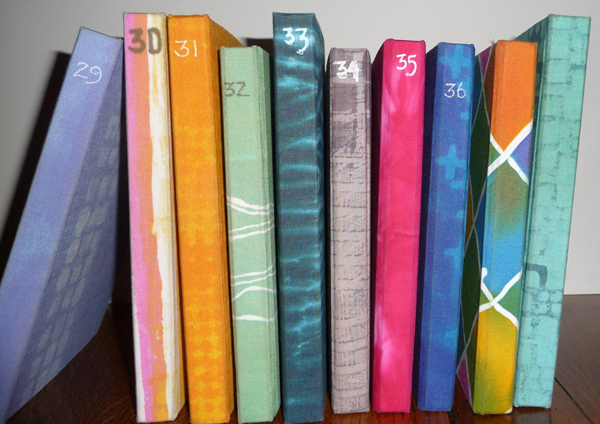 These watercolor sketchbooks were made with my bookcloth - white cotton fabric that was manipulated and dyed using procion MX dyes. All of them are full, even though I haven't numbered the last two before they were put up on the shelf. I just finished two more - one 5.5 x 7.5" portrait style and one 8" square. The blue one is my current daily sketchbook. 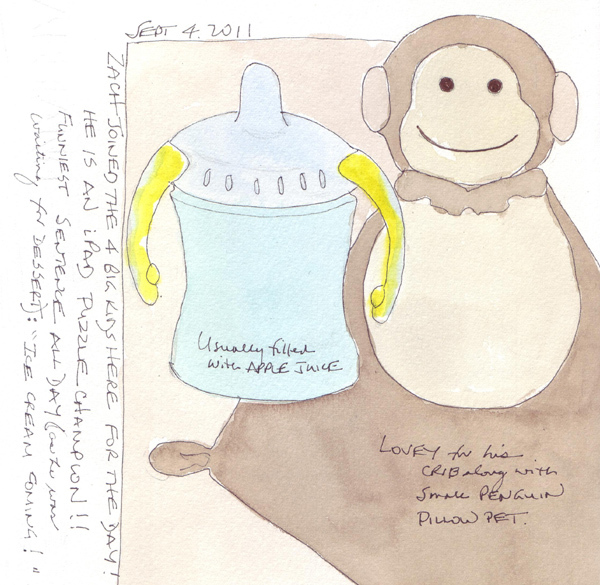 Each of my sketchbooks has Fabriano Artistico 140 lb Soft Press paper. Getting the book size and the paper I liked was my initial motivation for making a sketchbook. 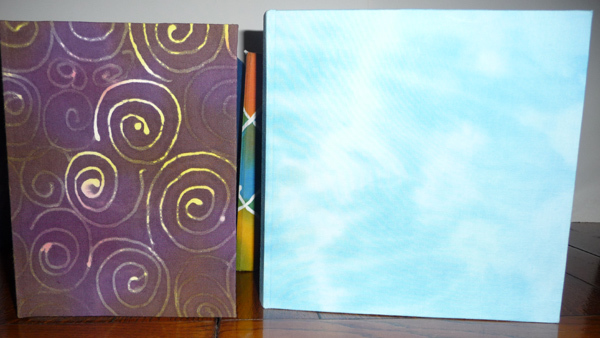 Then I decided that I really loved binding books and making my own bookcloth is a complete joy. I get to work with different resists, fabric manipulations, stamps, screens and monoprinting. My series of black sketchbooks that were made with commercial bookcloth are so blah! The recycled books, sketchbooks with black bookcloth, and covers of some of these books can be seen by scrolling through the following blog category. There is also a tutorial for how to recycle a book to make a watercolor sketchbook - that was how I started on this journey. I just did several exercises from the 3rd Lesson in Kate Johnson's Mini-Watercolor Pencil Class. 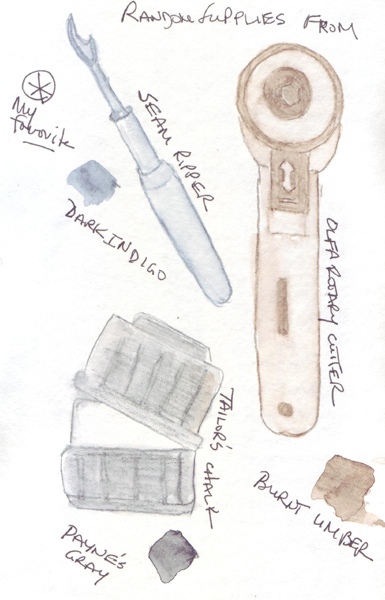 Exercise 1: I sketched randon tools from my sewing desk with neutral hue watercolor pencils (7 total) and decided that I liked the Albrecht Durer (A.D.) Dark Indigo and Burnt Umber best. They have now been added to my everyday pencil/pen/eraser case so I can really try them out. Exercise 2: I used one watercolor pencil to do an entire drawing - trying to achieve light, medium, and dark values. 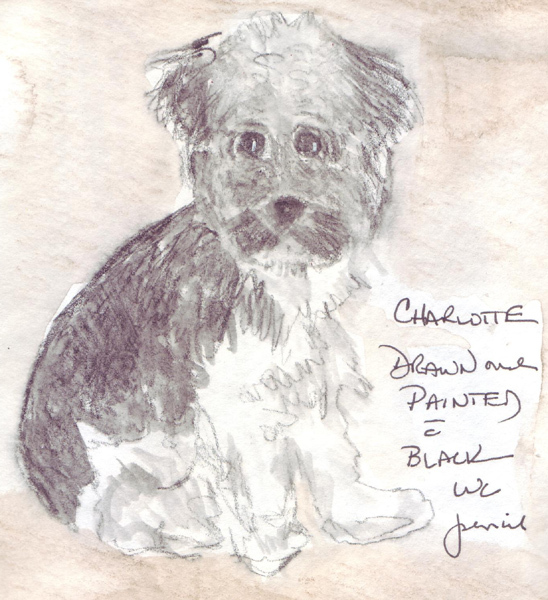 This sketch of my Grand daughter's dog was done with a black A.D. pencil. 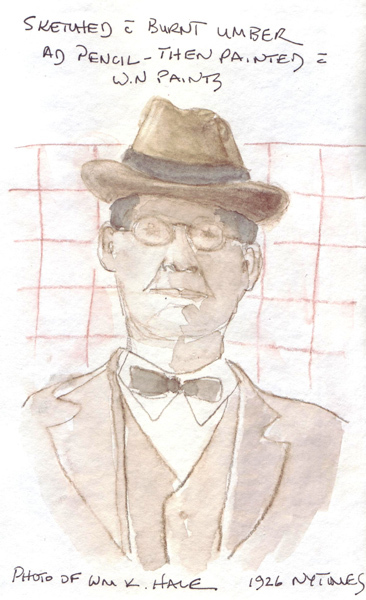 Exercise 3: I quickly laid down lines for this portrait (taken from a photo) with the Burnt Umber A.D. pencil and then painted it with W-N watercolors. 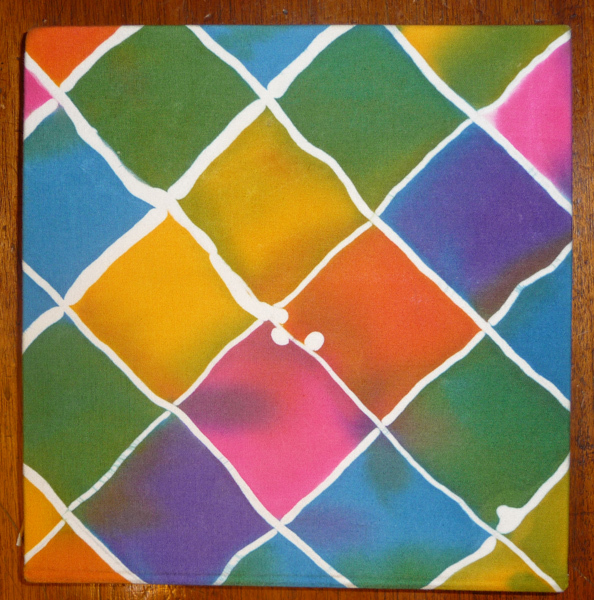 I will be in Chicago next week, so I scheduled a blog post with photos of my watercolor sketchbooks - that I make with my procion MX dyed fabric as bookcloth. There is also a link to a tutorial for the method I use to make watercolor sketchbooks from inexpesive out of print books. NOTE: My fabulous son Jason solved my blog problems this weekend, so hopefully there will be no further difficulties with access or comments. We had from 2-5 grandchildren here with us, without their parents, from Thursday through Sunday. My husband and I love to have them overnight and now that the 4 oldest are 4-8 years old, they are really capable of amusing themselves for long portions of the day. However, we try to plan adventures whenever possible. 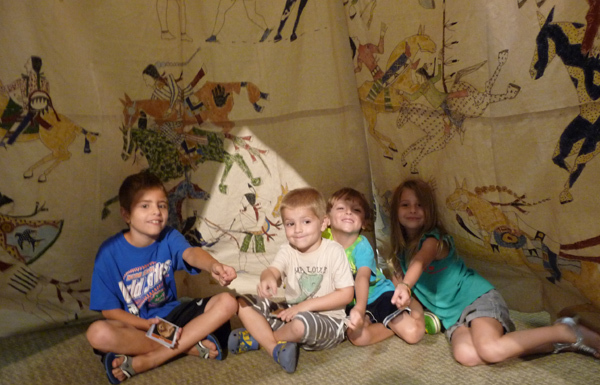 On Friday we took the subway to Bowling Green and started at the National Museum of the American Indian. It was the first visit for everyone except me. One highlight was getting an adventure brochure with 12 cards for objects that they needed to find in the permanent exhibit. The other was playing in the "tipi." On Saturday we took the bus to the Central Park Zoo and had unusually good luck seeing the animals. The penguins were energetic, the polar bear was playing in the water, and the snow leopard was pacing on the rocks in his woodland enclosure. 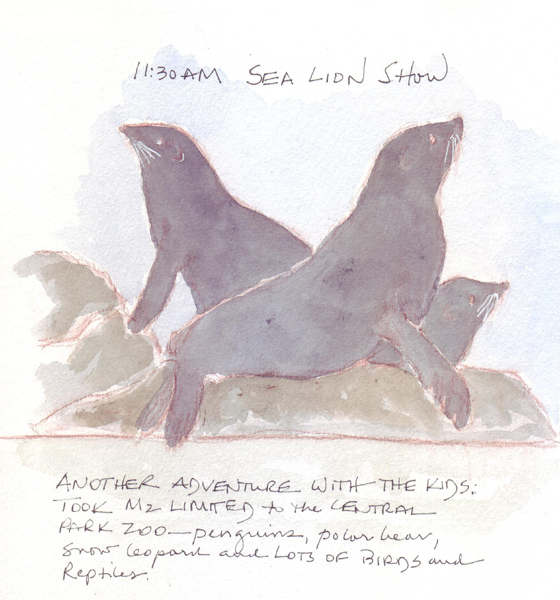 We ended with the sea lion show and I was able to sketch the sea lions while we watched them being fed. I used a mahoghany watercolor pencil and then painted them with watercolor later. Early Sunday morning the 2 year old joined the group and they all just wanted to play together in our apartment. After everyone departed, I did a sketchbook page for Zach.